The Point – winter roast series | rubybeanx. The Point is one of the restaurants on my ‘to eat’ list, but haven’t managed to due to being a poor student. Being a lover of all things carnivorous, I love a good roast. 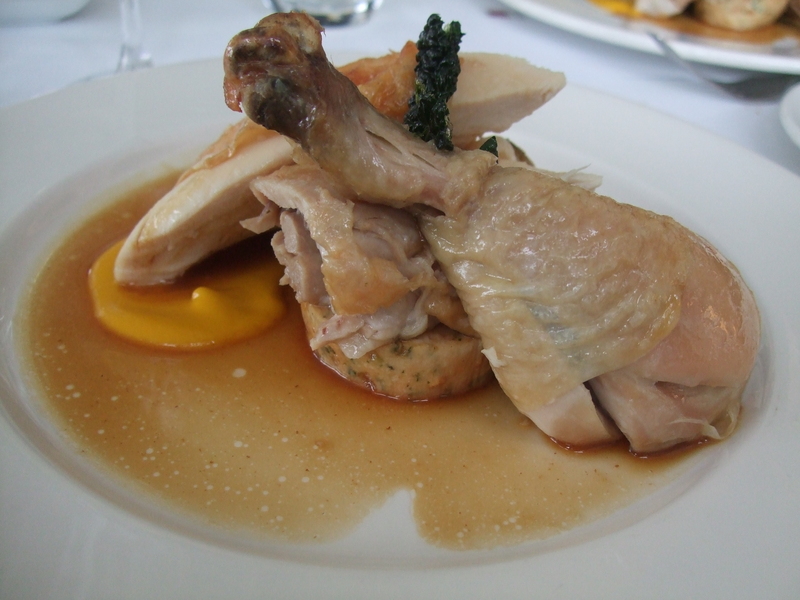 Spread across 3 sittings, The Point’s annual roast series featured roast pork, roast chicken and roast beef sessions. We sat for the yummy roast chicken lunch. At $60 a pop that includes 3 courses and wine, it’s probably the only occasion that I could afford to go to The Point. Oh boy I’m getting hungry thinking about it now! For starters, we had amazing crusty bread with creamy goats cheese with truffles and rich butter. If I left after the bread, I would already be happy. For entree we had a wonderfully hearty green pea and ham hock soup. 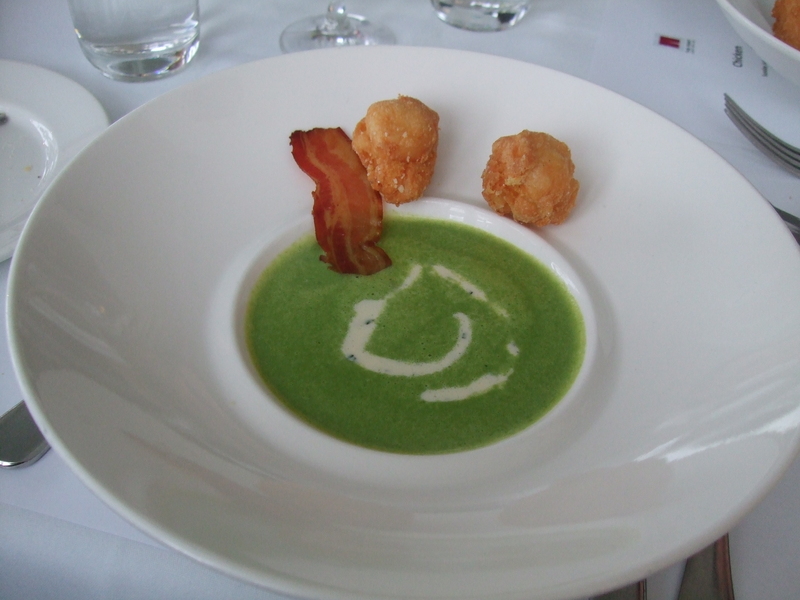 It came with little gruyere croutons that reminded me of a luxurious chinese donut. I used the croutons to shamefully wipe up all my soup. Fine dining shmining, I’m not gonna leave a single drop of a delicious soup behind! Then, our mains came. A generous pile of golden roast chicken sitting on a bed of gravy and pumpkin sauce, with 3 wonderfully buttered and roasted brussel sprouts and a perfect circle of stuffing. On separate plates were shared roast vegies and cos lettuce with blue cheese dressing. The chicken was so perfect, moist and delicious. All the herbs and spices tucked under a golden brown skin with every part of the chicken being soft and tender. Nobody faulted their dishes except for a minor remark of wanting a tad more gravy. And finally, dessert appeared. 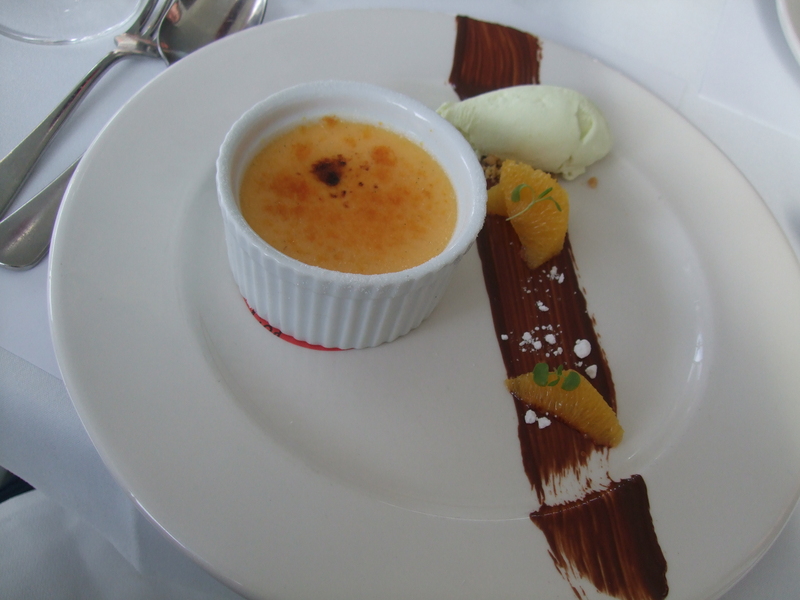 While feeling so full, nobody complained about fitting in the creme brulee with apple sorbet. The apple sorbet really stole the show, tasting like green apple chews, divinely creamy and served with a scattering of crumbled biscuits, to form a kind of abstract apple crumble. Brilliant, simple and delicious! That really summed up the Point dining experience, while the dishes served were familiar, Chef Scott Pickett’s simple attention to detail and creative twists just lifted the food to a spectacular experience. I must also mention that the service is ridiculously attentive and efficient. So, thus sadly ended my lunch at the Point. It was one of those occasions where I wished the meal would never end and the three hours spent there just flew by. Like Cinderella, after such pampering and prestige, sadly the clock would strike midnight and I’d have to return back to my pumpkin and lead the humble student life until Prince Charming finds my shoe and shouts me dinner at my new favourite restaurant. Tags: Albert Park, chicken, roast. Bookmark the permalink.